Daily scheduled inspections and supervision of: airport facilities, aircraft, aviation technical personnel, supervision in compliance with standards and regulations, identification and elimination of actions, attitudes and conditions that represent risks. Accident and incident investigations Coordinate and implement current security systems and procedures. 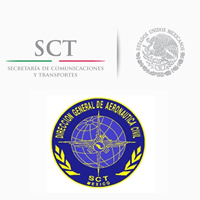 The DGAC also coordinates its efforts with other federal authorities to ensure aircraft and airport security. Phone: +52 55 5723-9400 and 5482-4100, ext. 18918 and 18927 of 09:00 to 16:00 hrs. Government Building, first level, Office No. 30. Phone: +52 55 5723-9400 Ext. 18934, 18935 of 09:00 to 18:00 hrs. Ext. 18936 Customer Care 24 hours. Ing. Francisco Luis Quiroz Pulido. Phone: +52 5723-9400 Ext. 18920 hours of attention of 09:00 to 18:00 hrs. Phone: +52 5723-9400 Ext. 18923 Customer Care 24 hours..